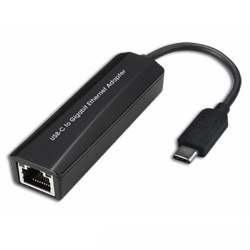 The USB-C to Gigabit Ethernet Adapter allows user's computer instantly connect to a 10/100/1000Mbps network through an existing USB-C port. No need to purchase an extra Gigabit network card and share a PCI or Cardbus slot. With compliance with USB 3.0 specification, this adapter ensures true 10/100/1000Mbps network speed without any compromise. Besides, compact and bus-powered design means external power is not required. *Specification is subject to change without notice.